Not everyone knows what it stands Vtec, but probably almost everyone has read Vtec on vehicle sales brochure. Then what is it? And how Vtec works? Vtec ia an abbreviation of variable valve timing and Lift Electronic Control. Vtec is a regulator valve technology discovered by Honda and still used by a range Honda engines are not embraced the i-VTEC. VTEC there are a number of technological advantages, one of which lies in the ability of small-cylinder engine produces power comparable to large cylinder engine, and can provide good fuel consumption and can be used on a daily basis. This type of machine is designed to improve efficiency, reduce exhaust emissions and engine generates maximum employment. VTEC consist of two types namely economy VTEC and VTEC power. Economy VTEC rather refers to the efficiency and power. This technology using 12 the valve or 16 the valve with 2 rocker arm in the intake, where 1 for efficiency and 1 others to power and large torque. VTEC power that usually called true power. This type of VTEC refers more to the power and torque is high and not too concerned with efficiency. VTEC engine power is used 3 to intake rocker arm per cylinder. 1 for efficiency, one for power and efficiency and the last for power and torque are very large. Basically VTEC technology uses a design with 16 valves, where the incoming air flow will be more and expedite air entering the combusting chamber. 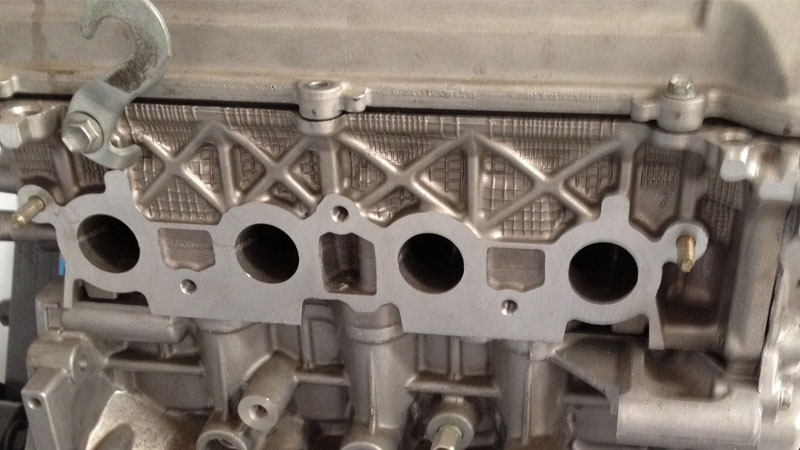 Reviewed VTEC engine, there are two different duration and lift on the intake cam shaft and each cam shaft that are different each rocker arm. When the engine rotates at low speed, VTEC is not active. Reviewed VTEC engine, when VTEC inactive, many variants of the valve open, no valve intake is only open from 1 to 12 of the valve is open, there are 1 valve intake is fully open and the first valve is half open, so that together with the 14 valve is open and there are two valve intakes open but only open half that makes VTEC inactive or off, in this condition the machine has a very high fuel efficiency. Besides that, when the VTEC engine active or ON, it means an open 16 valves is complete and whole, in which the air entering the combustion chamber smoothly and debits increased to boost acceleration and power in the machine. VTEC technology will be active depending on the oil pressure in the engine head are governed by VTEC solenoid, when the oil pressure in the head has been insufficient, VTEC solenoid will be open, so that the oil pressure will enter and push pin and lock on a rocker arm which has a greater duration and lift. Solenoid VTEC will open depends on the ECU and the ECU will open the solenoid VTEC depending on throttle position, engine oil pressure, engine temperature, engine rpm and engine speed are calculated and sufficient entirely to open the solenoid VTEC that oil pressure can came in and push pin so VTEC on. Brake Drums and Shoes: How Do They Work? Rain Sensors and Automatic Wipers: How Do They Work?